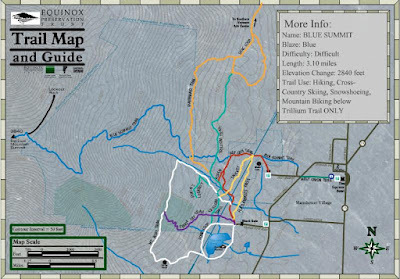 DESCRIPTION: The Blue Summit trail starts on a wooded road with a moderate incline that gets steeper and steeper as you progress. You'll pass several perpendicular trails passing the Thomson Preserve house after ~1.0 miles. Keep in mind you're hiking 2800 Ft in 3 miles, the first 0.5 miles is moderate, the middle 2 miles are steep the last 0.5 is a gradual incline to the summit. NOTES / COMMENTS: This was a Jekyll and Hyde trail brutally steep on ascent and quietly simple to return. A thin blanket of crusty snow started at ~3000 Ft. Traction wasn't needed but will be withing a few weeks. The Summit was breathtaking with 360 degree views and the culture shock of an Auto Road, parking lot and abandoned Equinox Inn. Take the time to hike the 0.3 miles along the summit ridge to visit the spectacular views to Stratton Mountain and Manchester Center from "Lookout Rock".